Over the holidays, I visited my relatives in Woodstock, Georgia whom I haven’t seen in more than 5 years. A lot has changed since then including them moving 10 minutes away from Downtown Woodstock. 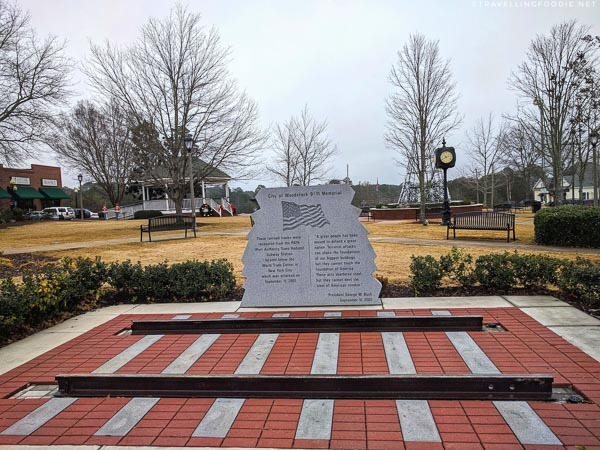 Part of Metro Atlanta and located 30 minutes from Downtown Atlanta, Woodstock in Cherokee County is what I’d call a small city with big city offerings. It has grown a lot over the years. Woodstock’s population has tripled from 10,050 in 2000 to an estimated 31,911 in 2017, and was one of Money Magazine’s Top 50 Best Places to Live in the United States in 2015. Downtown Woodstock is pretty straightforward as the entire downtown is about a 5-10 minute walk along Main Street. Did you know? The west side of Main Street is the historic part of Downtown Woodstock. The east side is the “new” but is made to look old for consistency. During my trip, I got to explore downtown and its surrounding. 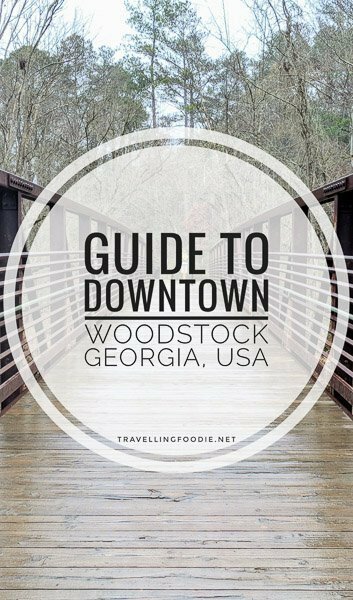 I’m sharing this guide to help you decide on what to do and where to eat in Downtown Woodstock! What’s one thing you normally hate when driving to a city’s downtown? It’s parking! Not the case for Downtown Woodstock. The area has lots of parking areas, and, best of all, they are free! This makes it so much better and easier to explore what Downtown Woodstock has to offer. If you want the easiest way to get around Downtown Woodstock, you can take a ride on the Woodstock Trolley. It’s free but only available during Friday and Saturday. The route has 12 stops and lasts approximately 30 minutes. Did you know? You can download the Ride Systems app (Android, Apple) to see the pick-up schedule and live location of the trolley. Aside from being the main tourist spot for the city, Downtown Woodstock is also quite historic. Even the Visitors Centre is located at historic Dean’s Store, which opened in April 1906 as a patent drug store and general store but has been the visitors centre since 2001. The Visitors Centre is unlike others. It is also a museum, an art gallery, a library and a mini store. Did you know? The first fountain Coca-Cola served in Woodstock was served at the Dean’s Store. Right outside the Visitors Centre, you won’t miss the caboose (railroad car). 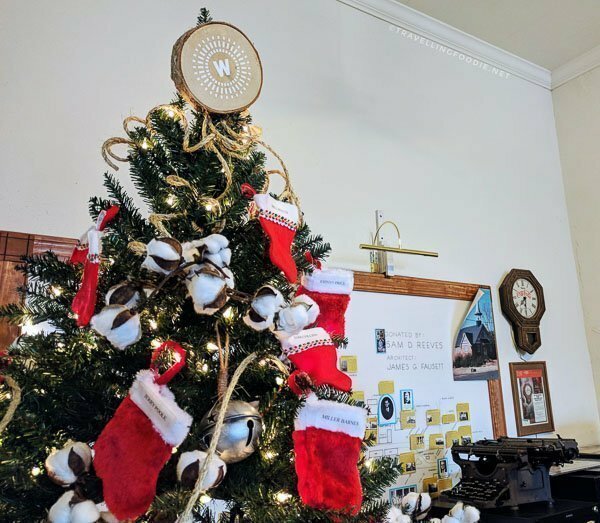 With Woodstock’s history of being a railroad depot since 1879, the caboose was given to the city as a 100-year anniversary present. Did you know? Even Woodstock’s new logo symbolizes the railroad. I love that they retain historic elements throughout the city. The establishments themselves still retain some of the old architecture and materials. A very unique one is Salon Bastille, a boutique style hair salon, which used to be a 1914 jailhouse. 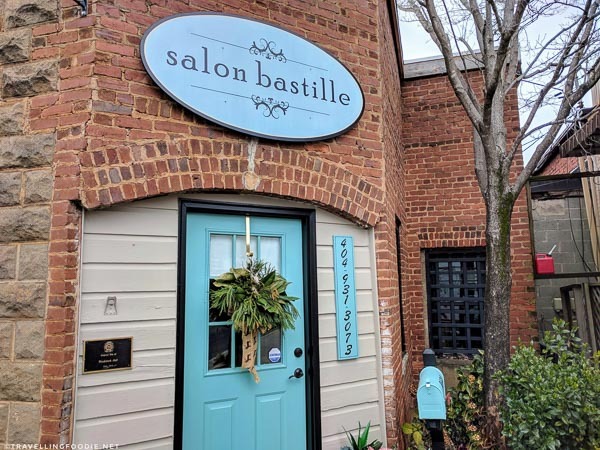 Salon owner Ashley Bahlau has kept the original iron bars, red brick walls, and even the warden keys of the old holding cell. Walking to The Park At City Center, you’ll find the city’s 9/11 memorial: two 12-foot sections of track from the subway station underneath the World Trade Center. Walk a little north and you’ll find the Dean House, the oldest house in Woodstock. Built in 1875, the house is actually owned by the owners of the historic Dean’s Store. Aside from history, art is also very prominent in the city. 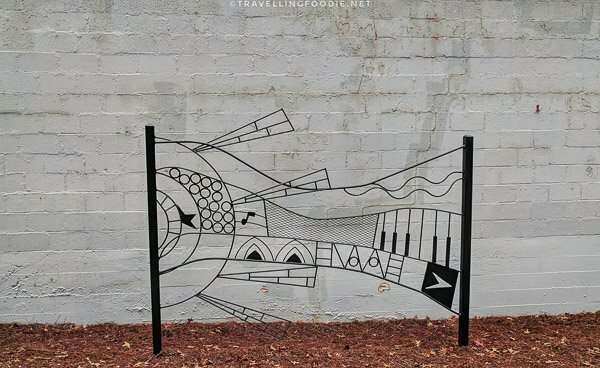 Downtown Woodstock is like a sculpture museum and garden on its own. You’ll find sculptures on the sidewalks, and they are actually up for sale. Need a break? 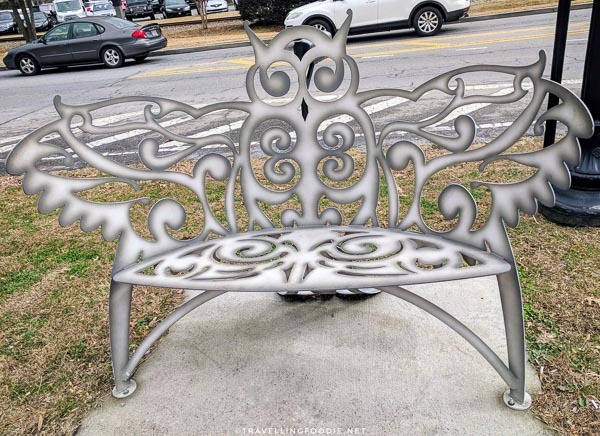 Even their benches are artwork! 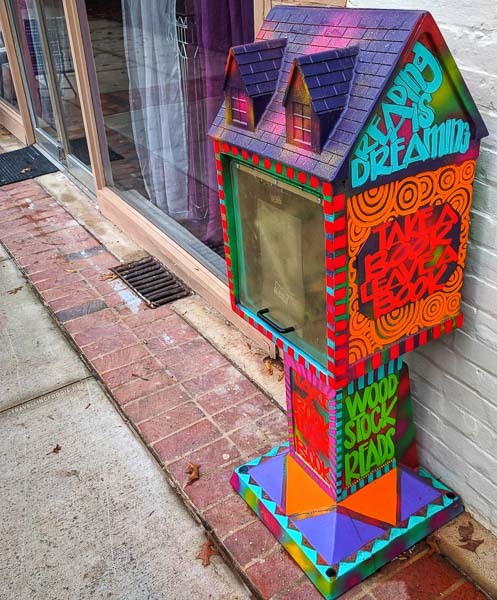 One thing I saw for the first time is this unique project called Little Free Library. The idea is to have these self-sustaining mini library installations, where you take a book, leave a book. Even the installations are very artistic. A big project that was happening on my visit was the Woodstock Community Mural being painted by artist Annalysa Kimball. 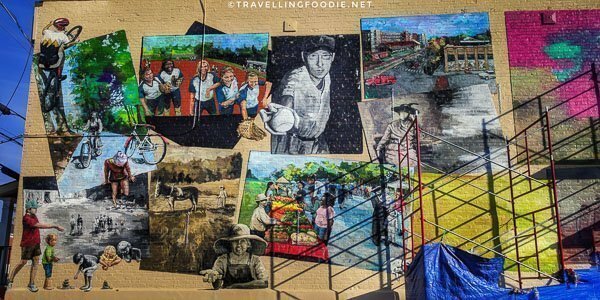 Located on the side wall of the Woodstock Pharmacy, the mural will depict images of Woodstock’s past, present and its relationship. 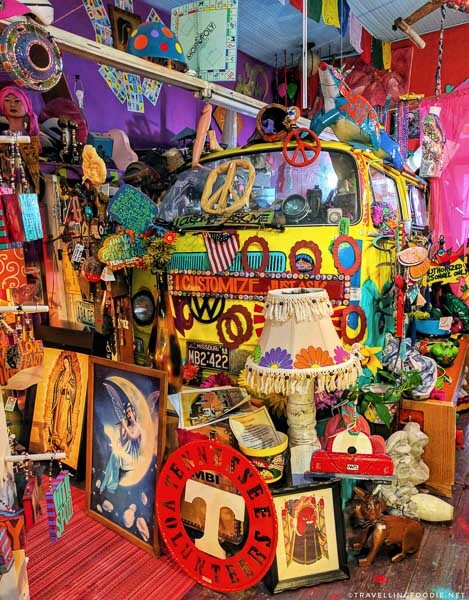 Annalysa wishes to highlight that Woodstock’s past is the foundation to its present identity of progress. Downtown Woodstock also houses a lot of performing arts. 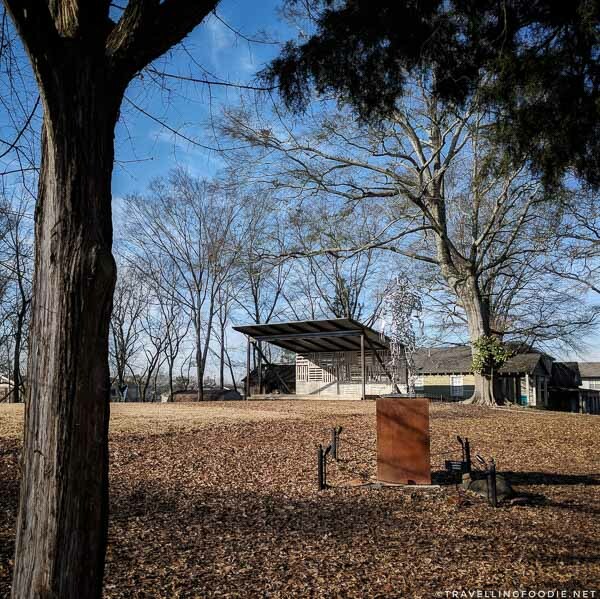 The Park at City Center is popular for the Northside Hospital Cherokee Amphitheater, which is used for the city’s Summer Concert Series accommodating over 7,500 music lovers. Across the park, an old church was re-purposed into the Chambers at City Center. It is also home to the Elm Street Cultural Arts Village for live theatre shows like plays and musicals. The Elm Street Arts Village Event Green, which is also like a sculpture garden, allows for outdoor performances and events. The Elm Street Arts Village Event Green is an endpoint of the Noonday Creek Trail, which allows you to hike or bike all the way to Highway 92 or Towne Lake Hills without driving a car. At the heart of this trail is the Woofstock Dog Park. 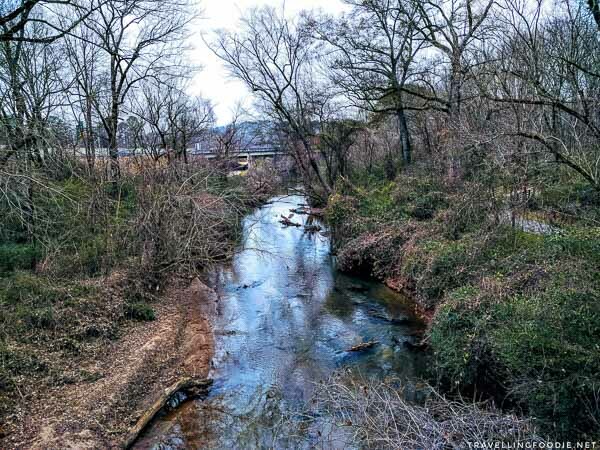 If you’re looking for a more isolated nature or intense hiking and biking trails, Olde Rope Mill Park is about a 7-minute drive from downtown. Did you know? The park has traces of history of being a Rope Mill. You can find ruins of the mill operations along the Little River from when it started as a grist mill in 1840s to a rope mill in 1870s. 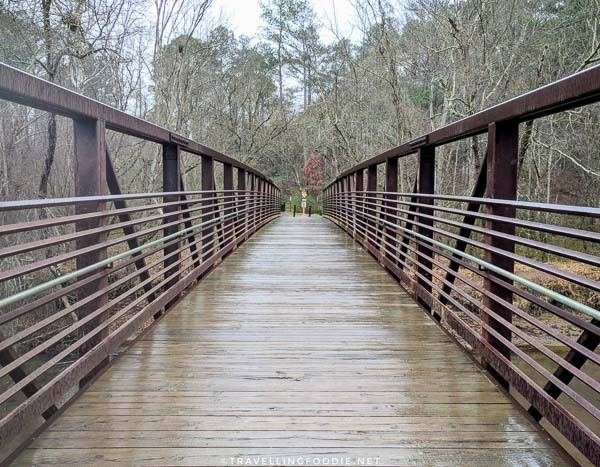 The park has 5 miles of paved walking trails and 14 miles of mountain biking trails. 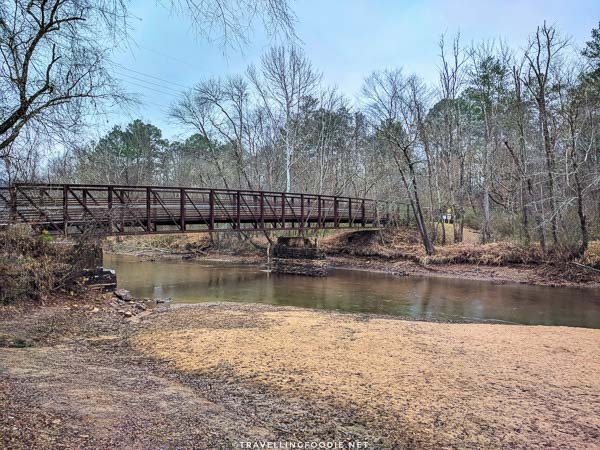 You can also do water activities like fishing and canoeing thru the Little River, or simply enjoy being outdoors and have a picnic in the Picnic Areas. Reformation Brewery is the only brewery in the city. 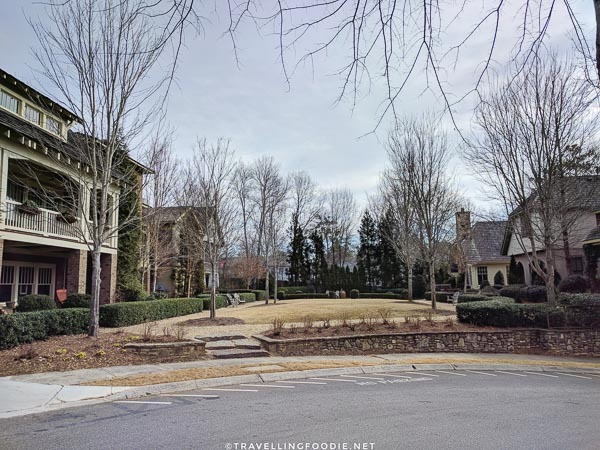 It’s walking distance from Downtown Woodstock, and is also a stop for the trolley. Travelling Foodie Tip: They have free guided tours on Friday (7pm), Saturday (3pm, 7pm) and Sunday (3pm). 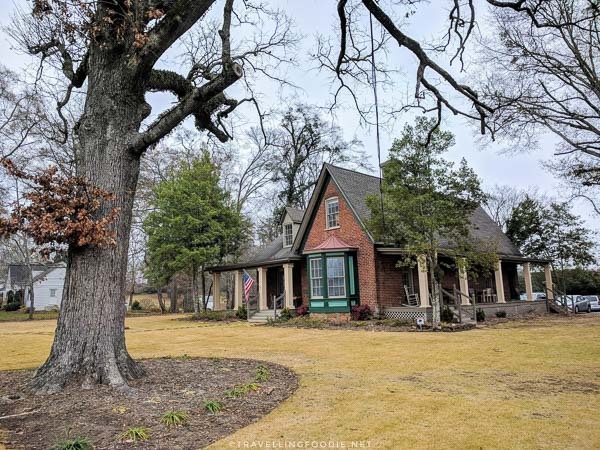 They have a nice family friendly patio, as well as pretty cool events (updated on their website) like live music, trivia nights, improv, food trucks and even journal writing and book gatherings. About 1 mile from Olde Rope Mill Park is The Outlet Shoppes at Atlanta with nearly 100 known brand name stores. This is the closest outlet mall from Atlanta. 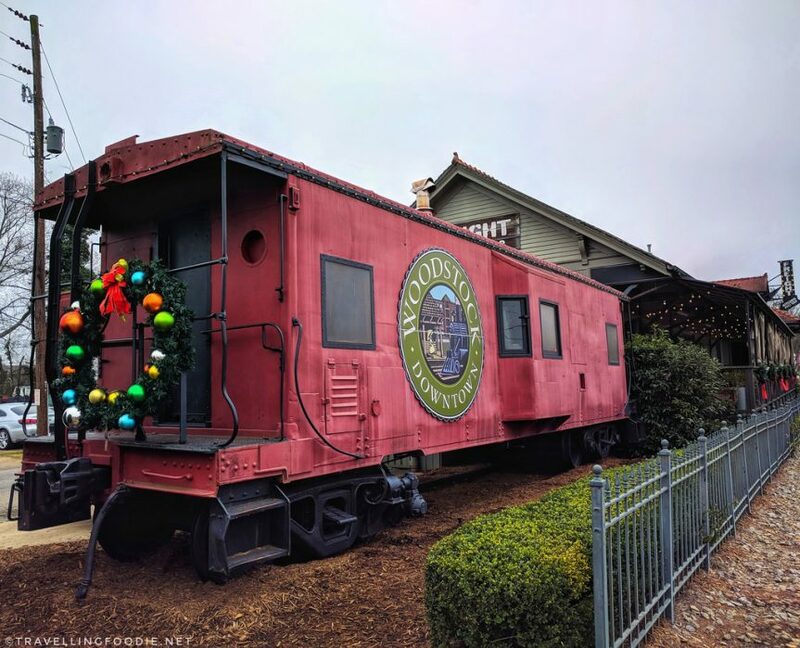 You can actually get to the Outlet Shoppes through the Woodstock Trolley. 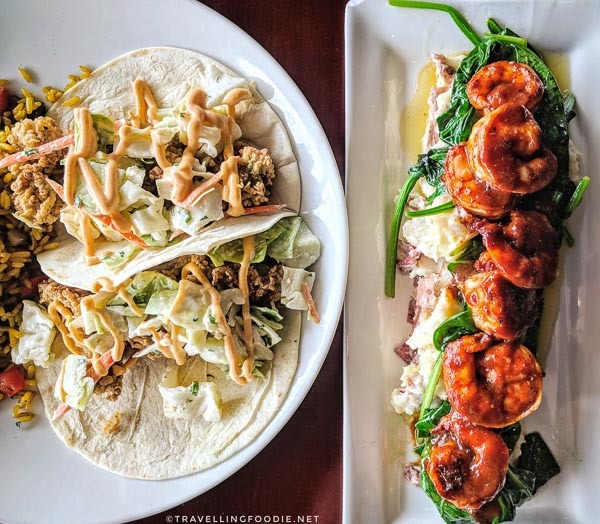 Travelling Foodie Tip: Every Tuesday is Tuesday Trivia Night at 6:30PM where you can win Outlet Shoppes gift cards ($250/1st, $100/2nd, $50/3rd). If you’re looking for food while you’re there and cannot make it to Downtown Woodstock, try Taqueria Tsunami. They offer Latin-Asian inspired menu which is a refreshing change to typical chain restaurants found in outlet malls. – Avocado Cilantro Egg Rolls ($7) – Homemade and lightly fried. Served with a Santa Fe ranch & sweet and spicy Thai sauce. 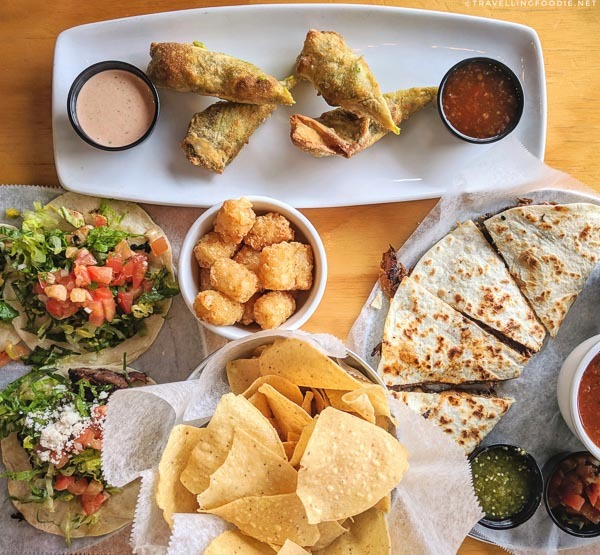 – The Quatro Tacos ($11.50): Choose your 3 tacos served with a choice of a side. We chose 2x Rich Man’s Tacos and Pacific Rim Taco, plus Tots with Jalapeno Queso. If you’re looking for something special to buy, shop in Downtown Woodstock. I was quite impressed with the amount of specialty boutiques here. Most of them have unique offerings that don’t overlap with each other too. Blue Frog Imports has got to be one of the most interesting boutiques I’ve been. They have very out-of-the-ordinary things that are super artsy with funky colors. The Wright Stuff Records & Collectibles is perfect for collectors. 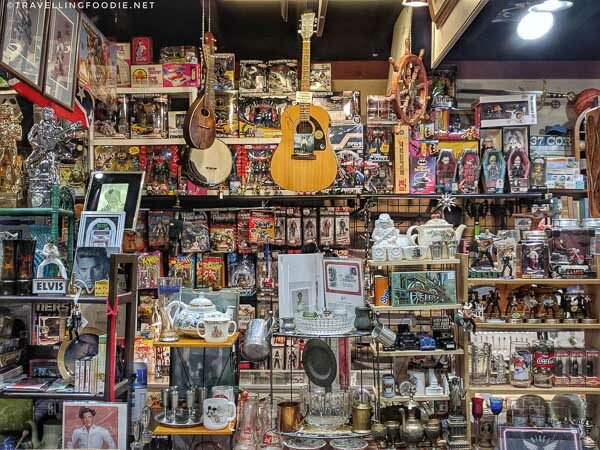 They have a wide variety of collectibles from record albums, toys and comics to US & foreign coins, antiques, TV/movie memorabilia, and sports cards. I was surprised that there was even an area at the back which was full of mostly Funko’s Pop! Vinyl Toys. 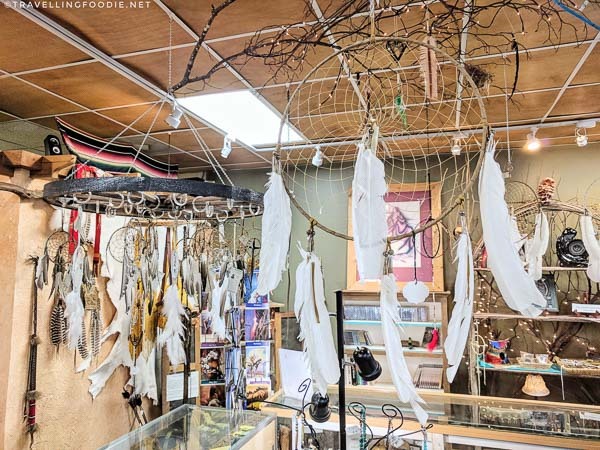 If you’re looking for Native American goods like artwork, handcrafted products and artifacts, you’ll want to check out Seven Arrows Art Gallery. 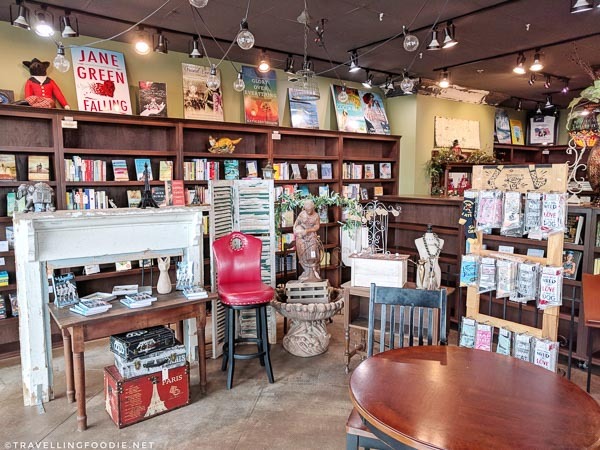 The only bookstore in Downtown Woodstock is FoxTale Book Shoppe, known for a wide range of unique and indie books. 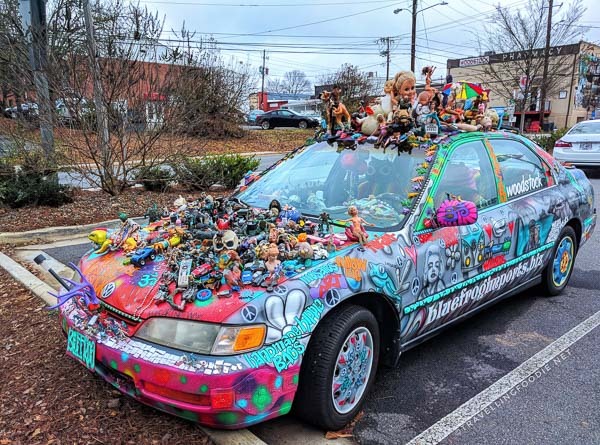 They’re quite popular for author events and book signing in the Southeast. Perhaps the most surprising for me was seeing these two specialty stores, which are actually in detached houses with their own parking lot. The Whole Nine Yarns is about all things yarns and fiber. They even have a calendar full of knitting classes. 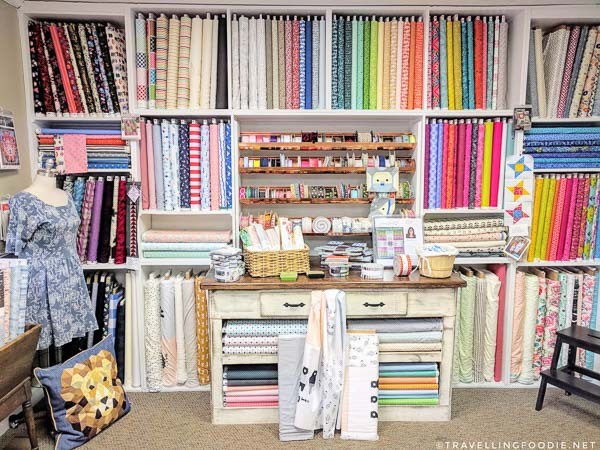 And if you prefer sewing than knitting, Sew Main Street is all about sewing! They also have a sewing and quilting classes. Did you know? Both Sew Main Street and The Whole Nine Yards are have the same owner, Debi Light. 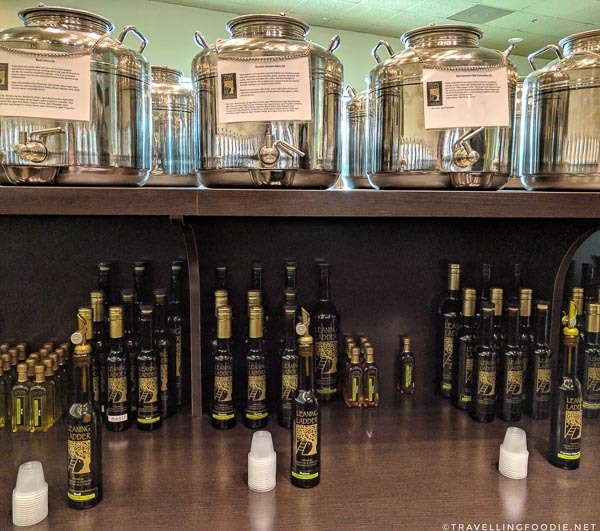 For the foodies, you’ll definitely want to check out Leaning Ladder, a premium olive oil and vinegar tasting boutique. I was shocked with the variety of olive oil and balsamic vinegars they have. It’s probably the most I’ve seen with 12 extra virgin olive oils, 20 fused and infused olive oils, 35 balsamic vinegars and 5 specialty vinegars. 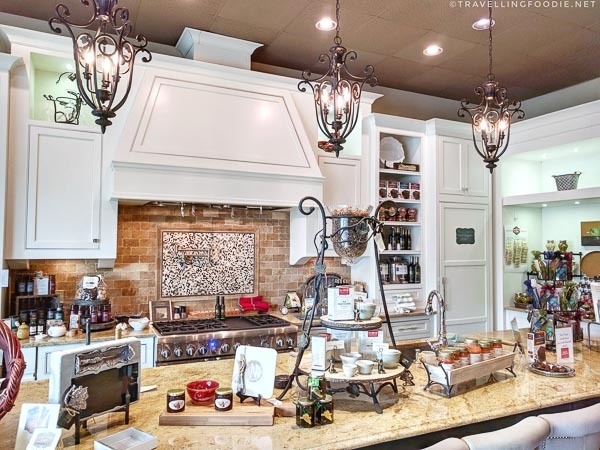 Every month, owner Susan hosts 3-4 cooking classes that utilize the olive oil and balsamic vinegars. There are even guest chefs on some of the classes. When I visited, Susan made me try mixes of olive oil and balsamic vinegar that created totally new flavours! It was mind-blowing! For such a small downtown, I was surprised with the food scene in Downtown Woodstock. There are over 20 restaurants to choose from in that short stretch along Main St.
To step up their game even more, the downtown is part of the Entertainment District, allowing people to buy drinks, including alcoholic beverages, in to-go cups from participating restaurants so they can sip and stroll. One thing I’m glad about the restaurants here is that they are mostly local, or, if not, at least they are local to Georgia. This makes it a great option for dining, especially if you’re going to the Outlets, since you can only find them in Woodstock. Located in a century old house, Century House Tavern is one of the most popular restaurants in Downtown Woodstock. Did you know? Built in 1894, the house was once known as the Hubbard House. Chef Daniel Porubiansky, a Woodstock local himself, worked at Atlanta’s popular restaurant, Bacchanalia, before coming to Century House Tavern as both executive chef and partner. 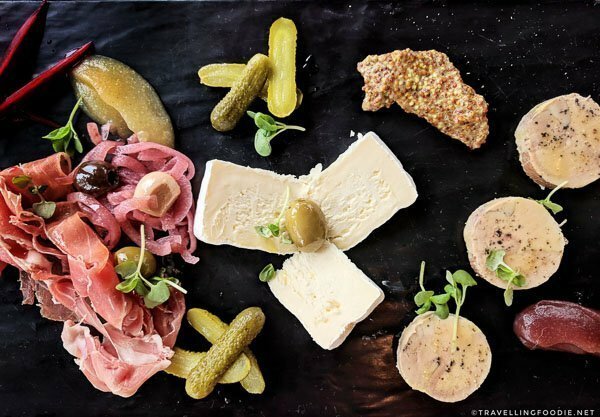 With his relationships with farmers and love for fresh ingredients, you can expect fresh local and farm to table dishes like the Charcuterie and Cheese menu, aptly called From The Butcher & The Cheeseman. 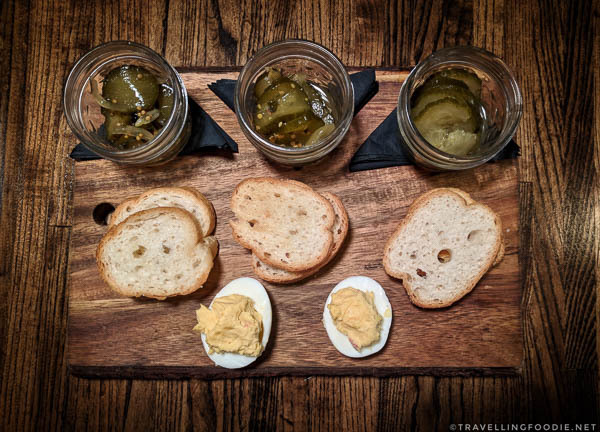 Travelling Foodie Tip: Ask the server how to pair the meat and cheese with the accompaniments to get the best combination! A must-order here is the mind-blowing Jack & Coke Glazed Pork Belly, combining mixed drinks with savoury food into one. The burst of flavour just works with the sweetness of coke, saltiness of the pork belly and the smokiness of the Jack. 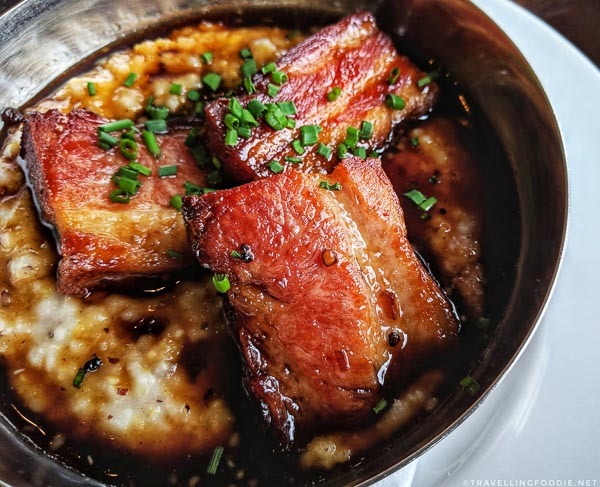 The grits even got much better from the pork belly fat that went to it. I’m not the only one who thinks this dish is noteworthy. My Instagram post on this was so popular it was further featured by Zagat and Best Food Atlanta. Truck and Tap prides itself in being “not your ordinary bar and restaurant”. And it’s true! Their concept is pretty cool, and their name gives a hint to it already. The restaurant side is run by a daily changing food truck at the back! You can find the weekly schedule on their website. 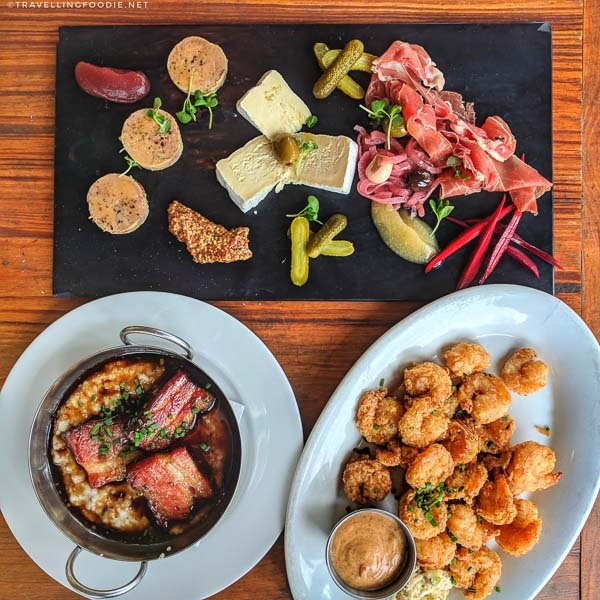 Their tap room has a weekly rotating selection of craft beers in 12 draught lines carefully curated by their in-house cicerone to pair with the food. The day that I went, I was lucky that the food truck was another Downtown Woodstock restaurant, Yumsa International Market, which specializes in South African comfort foods. 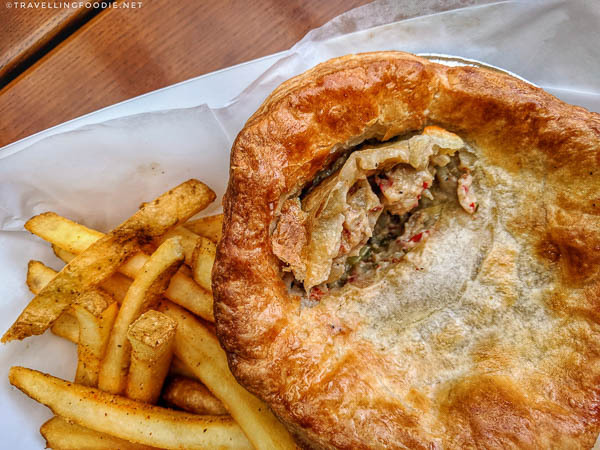 Be sure to try their crawfish pie which is packed with crawfish and breaming with South African flavours. 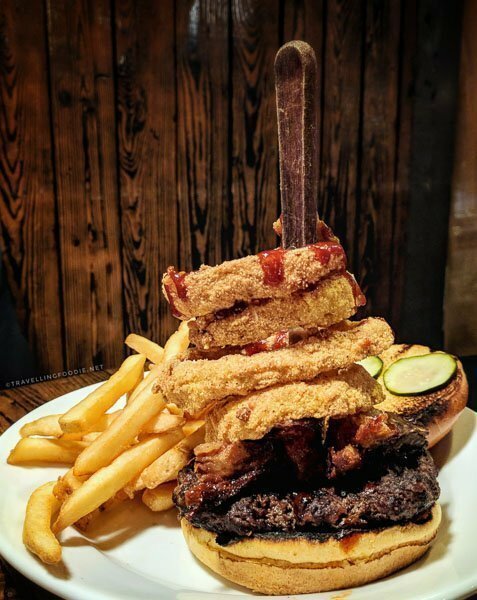 You can’t really visit Georgia without trying Southern Cuisine. At Freight Kitchen and Tap, you get to do two things: try southern food as well as get immersed in history. 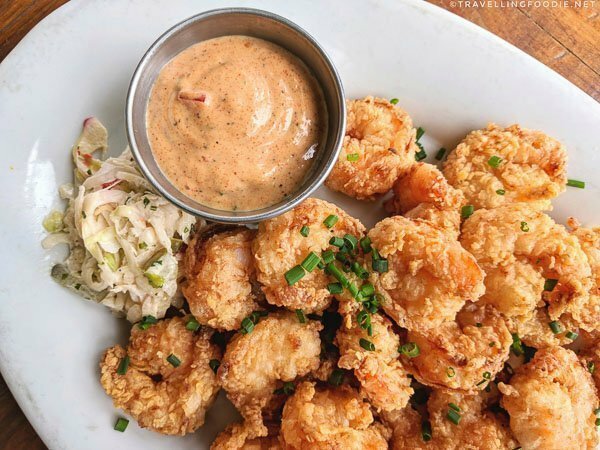 Located at a historic train depot which also became a fire department, police department and city hall before ending up as a restaurant, Freight Kitchen and Tap offers a seasonal menu with regional southern cooking using farm-to-table concepts. Their drink menu boasts 22 taps that rotates popular and new local craft beers, as well as the area’s largest whiskey selection. If you’re looking for your #foodporn shot for Instagram, this Pork + Burger would be it. I love how they stacked the rings with a knife going thru the burger. 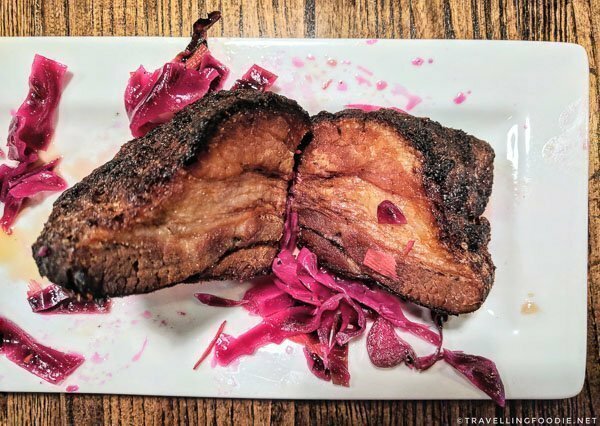 For starters, you must try their Pork Belly. It’s a big slab of crunchy yet tender pork belly with a good ratio of meat and fat. The apple cider reduction helps cut through the fattiness of the pork. 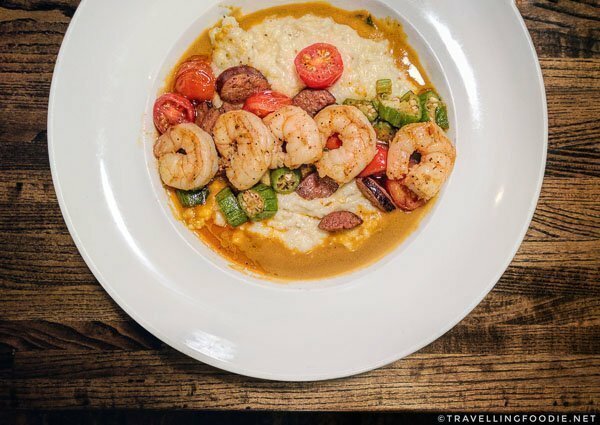 I definitely had to try something distinctly southern here, and what can be more southern than Shrimp and Grits. I loved that they used white cheddar for the grits because I love cheese. I enjoyed how the broth, Andouille sausage and okra actually made it feel like I was eating gumbo as well. Though I didn’t get to try it, I was told their most popular must-try is their Chicken and Waffles. If you’re a seafood lover like me, then you’ll want to try Reel Seafood. For Reel! Owned and operated by a husband and wife team, chef David Silverman cooks everything to order and Karen Silverman manages the front-of-the-house. 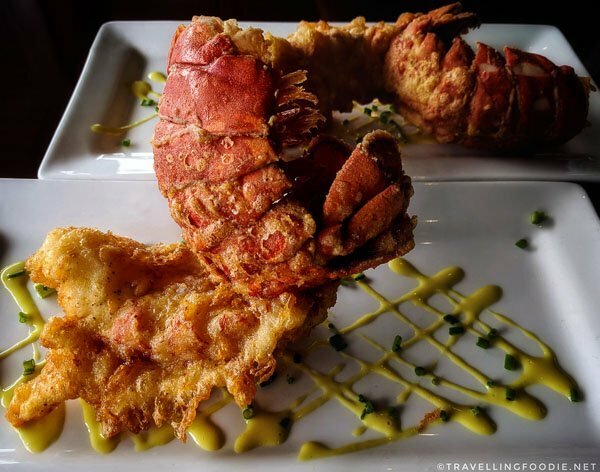 Travelling Foodie Tip: If you love lobsters, come during Tuesdays when it’s buy one get one Tempura Fried Lobster Tail! The lobster tail was big and fresh! I love the batter they used on the tail since it is light and subtle so as not to cover the taste of the lobster. I ordered the fried oyster tacos, which had good amounts of fried oyster. If you’re like me, you’re going to end up eating them on its own. From what I found out after, I should’ve ordered the BBQ Grilled Shrimp which is popular among customers and staff. 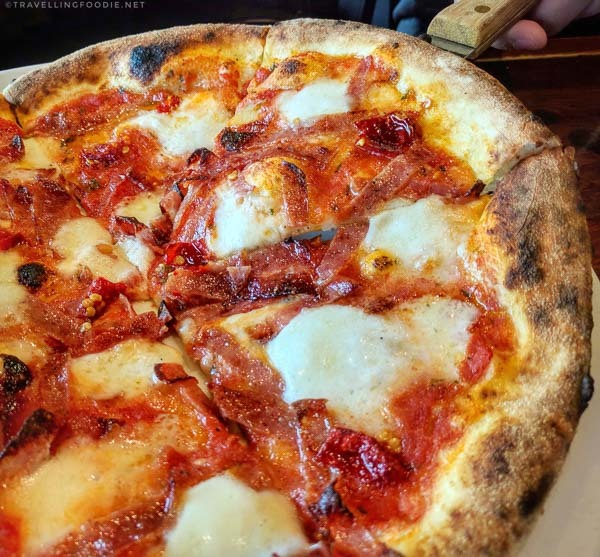 Vingenzo’s Pasta & Pizzeria is popular for their traditional Southern Italian food, especially their Neapolitan Pizza which has garnered them numerous awards and features. I love their open kitchen concept that allows you to see how they make the pizzas. When I visited, I only tried their Neapolitan pizzas. And yes, they were amazing. Their dough was the true winner here. When you bite into it, it is soft, elastic and fragrant as it should be with some crunchiness from the charring outside. For variety, we ordered the red sauce pizza, A-Pizza, and a white pizza, Salsiccia e Cipolle. The A-Pizza is a great choice if you’re seeking the classic Neapolitan Pizza with its San Marzano tomatoes and Bufala Mozzarella. 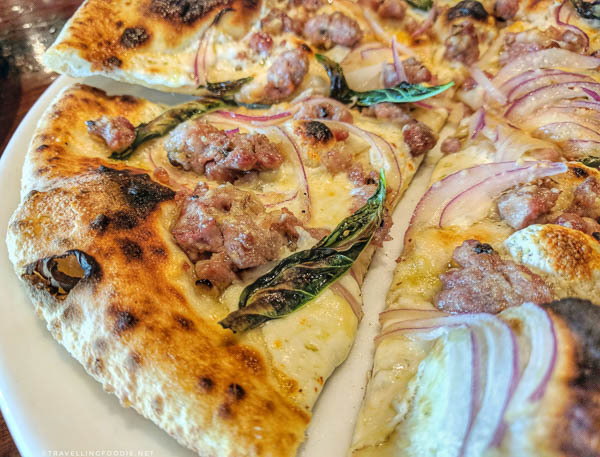 I typically prefer white pizza, so I just loved the Salsiccia e Cipolle. The toppings are simple but its simplicity brings out the best in this pizza. If you’re looking for live music and entertainment, MadLife Stage & Studios is the place to visit as they have shows, concerts and events at least three days a week. The night I visited, they actually had two shows going on: a stand-up comedy, which we watched, and a music concert. Aside from the shows, MadLife is also popular as a restaurant. It’s a great idea to have a restaurant here so people don’t feel the need to go pre-eat somewhere else before the show. They have off-menu nightly specials that Chef David creates to complement the vibe of the music being performed so be sure to ask about them. 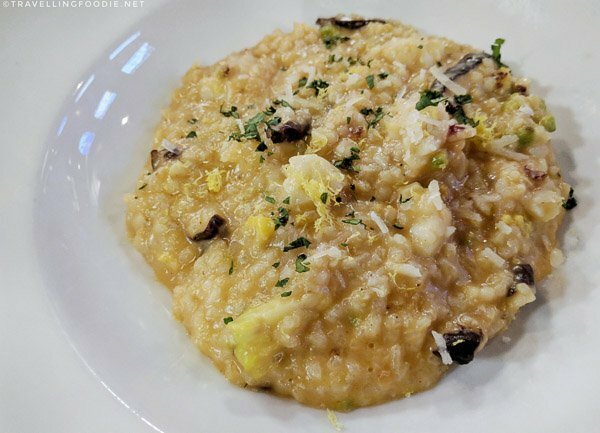 I’m so glad I got to try their Lobster Risotto special which had a good amount of lobster, and really flavourful cheese risotto. 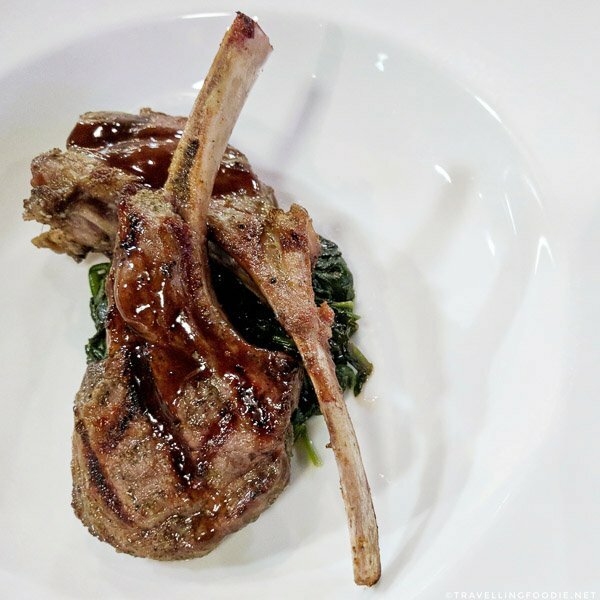 If you’re looking for meat, the Grilled Marinated Lamb Chops was a winner for me. The price is really good since you’re getting 4 pieces of lamb chops. The lamb was juicy, tender and grilled nicely with a good char taste. Travelling Foodie Tip: Substitute your fries or mashed potatoes to the Fresh Garlic Fries, and thank me later. 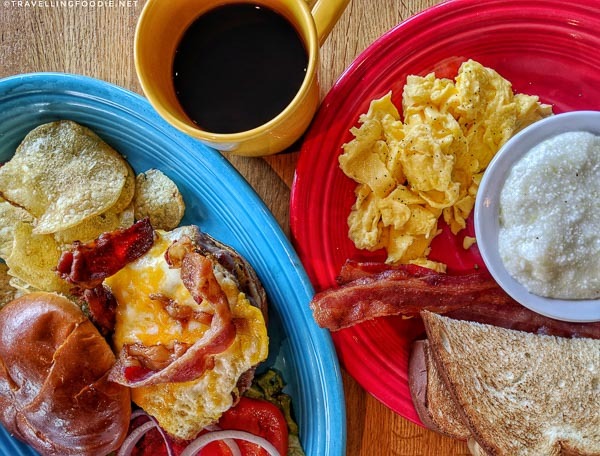 The only breakfast and brunch place in Downtown Woodstock is J. Christopher’s. Though not local to Woodstock, J Christopher’s is still local to Georgia. They serve your typical breakfast items ranging from omelettes, burgers and sandwiches, skillets to pancakes, waggles, crepes. Bringing that southern cuisine to your breakfast, you can typically change your potatoes to grits depending on the item. 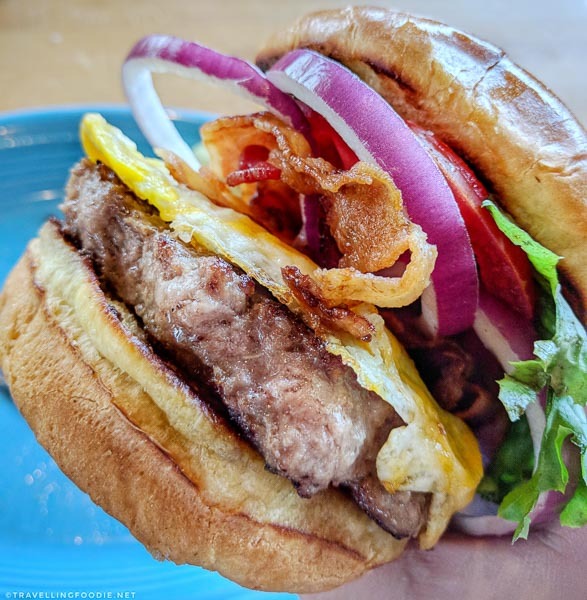 If you want the best of both worlds with breakfast and lunch, do what I did and get the Club House Burger which comes with bacon and fried egg. Their burgers are 1/2 pound of angus beef so it’s quite filling. Club House Burger ($9.49) – Topped with Cheddar and Jack cheese, crispy bacon strips and fried egg. There are only two dessert shops in Downtown Woodstock. If you have a sweeth tooth, Cupcakelicious has got you covered with sweet treats. Did you know? Their building was historically a grocery store dating back 1900. 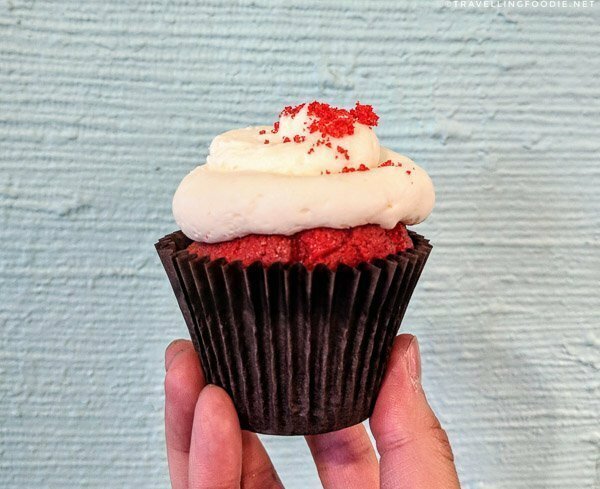 They have a wide assortment of cupcakes from common flavours like Classic Vanilla and Red Velvet to more interesting ones like Pancakes-N-Bacon, Reese’s and Birthday Cake. 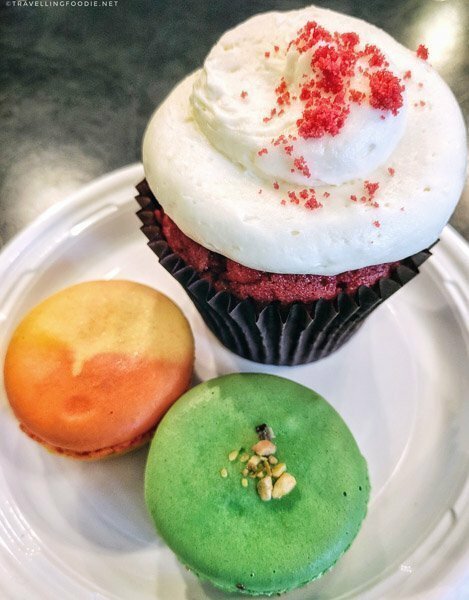 Though they are most known for their cupcakes, they also offer other desserts like Macaron Queen’s macarons, Greenwood Ice Cream and Sweet Shop USA chocolate truffles. 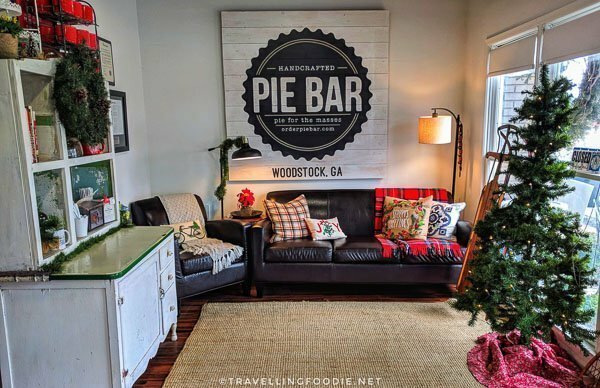 The other dessert shop in Downtown Woodstock is Pie Bar, owned by pie marker Lauren Bolden who you’ll usually find at the store working on the pies. 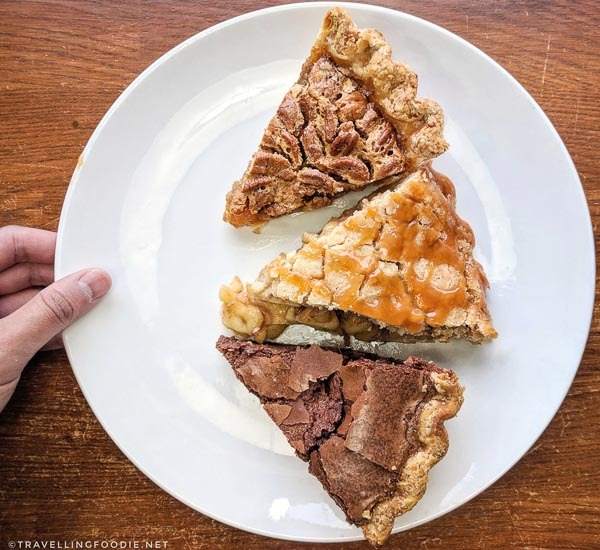 They are a take-out only pie store with a daily rotating selection of pies, but they have a few seats and tables for you to enjoy your take-out pies. For desserts, I typically don’t go for pies, but I had a deeper appreciation for them after trying the pies here. The pies here aren’t overly sweet, and the crust is just amazing. Prices range from $3-4/slice and whole pies are at least $25. 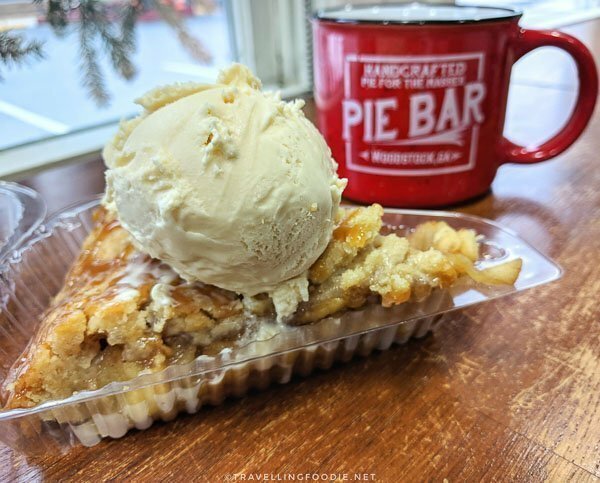 Travelling Foodie Tip: Warm up the Salted Caramel Apple Streusel Pie and top it with a scoop of vanilla ice cream. It’s SO GOOD! They also have Chocolate Chess Pie. I learned that Chess Pies are traditional Southern style pies which use cornmeal and vinegar. I enjoyed all three I tried, but my favourite is the Bourbon Pecan Pie. It had generous amounts of pecans and the right texture inside. Pie Bar also serves savoury pies. 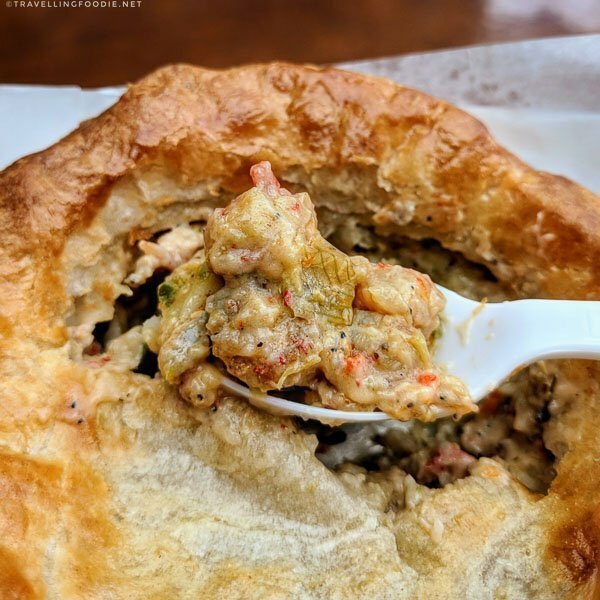 Though I didn’t get a chance to try it, I was told that their must-try is the Chicken Pot Pie. 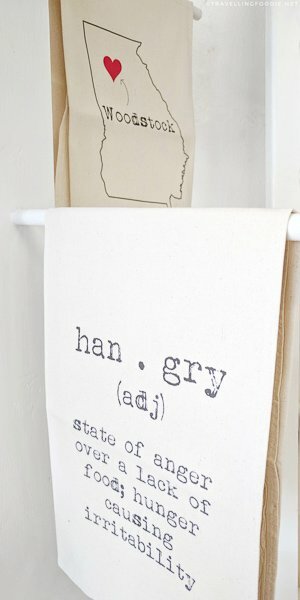 This wraps up my guide to Downtown Woodstock! 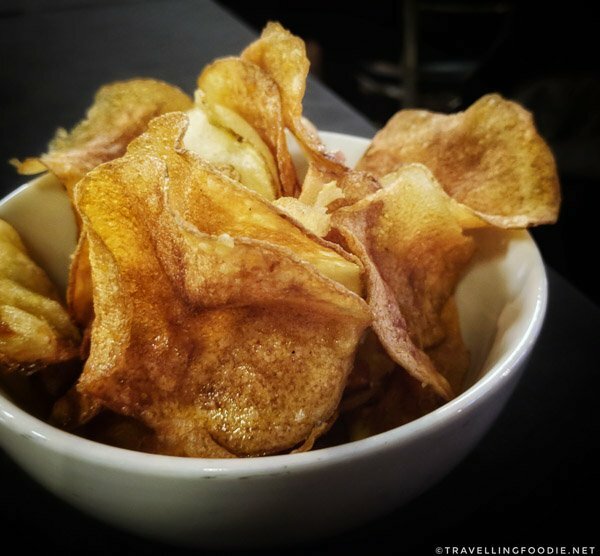 Did you get a better idea on things to do and where to eat in the city? If you have visited before, what did you find were the best restaurants and things to do in Downtown Woodstock? 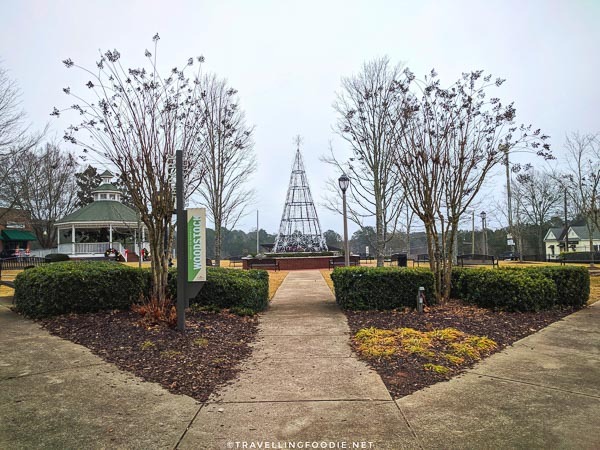 Huge thanks to Woodstock Convention & Visitors Bureau for sponsoring this post. As usual, reviews and opinions are entirely my own. You can learn more about Downtown Woodstock thru their website, or find them in Facebook, Twitter and Instagram. 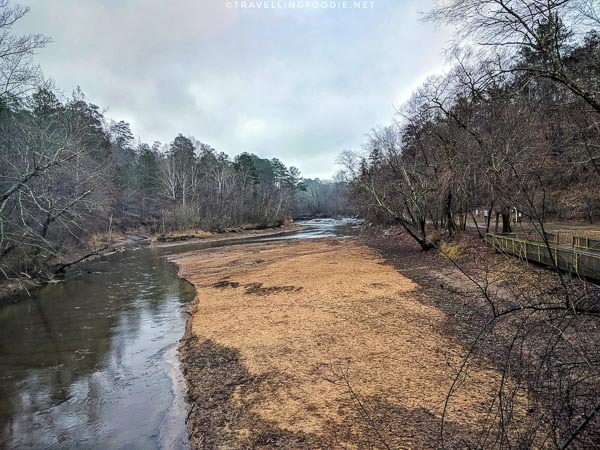 Posted on February 12, 2018 January 1, 2019 by Travelling FoodiePosted in Food, Georgia, Travel, USA, WoodstockTagged activities, entertainment, guides, nature, products, restaurants, sights and landmarks, transportation. Thanks for the information, I would definitely like to visit all these places. Thank you for visiting our city, we are glad you enjoyed the visit.